Investors have heard what business owners already knew: temperament is more important than intelligence. I recently observed a lecture Gary Mishuris, CFA delivered at Babson College entitled “How to Learn Value Investing.” In the presentation he said, “temperament is like a basketball player’s height. You can compensate a little, but it’s really hard to change your height.” This started me pondering my own temperament. Do I have the height for this game? Temperament: a person’s nature, especially as it permanently affects their behavior. Or, consider the synonym: spirit . What is the person’s spirit that most affects their behavior? I believe our nature drives our behavior. Behavior drives results. So, determining what drives behavior is very important to discerning long term results. Many people assume they first think grand thoughts and then execute those thoughts. This is not how life works. As an investor, I care about results. Estimating results in a complex and adaptive system like business is hard if not impossible. All possible interactions cannot be fully known so you must look at the basic forces that drive actions. I do not believe a strategy can be engineered to withstand the forces of competition no matter how intelligent you are. If temperament drives business results –either good or bad– then how exactly do we determine our spirit? Or the spirit of others? 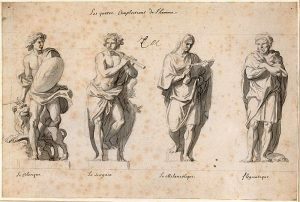 The Four Temperaments are often credited to Hippocrates (460-370 B.C.) After some discussion with my wife, we took an online quiz to determine our Temperaments. My results leaned toward Choleric. She was split between Sanguine and Phlegmatic. According to “The Four Humours” Choleric individuals tend to be more extroverted. They are described as independent, decisive, goal-oriented, and ambitious. These combined with their dominate, result-oriented outlook make them natural leaders. In Greek, Medieval and Renaissance thought, they were also violent, vengeful, and short-tempered. Good lead characters for tragedies. While I consider myself a very independent, goal oriented leader, I am also introverted and very patient. This is not very Choleric. My second highest score was Phlegmatic. Phlegmatic individuals tend to be relaxed, peaceful, quiet, and easy-going. They are sympathetic and care about others, yet they try to hide their emotions. Phlegmatic individuals are good at generalizing ideas or problems to the world and making compromises. I am absolutely empathetic and try to hide my emotions. I generalize problems and make compromises regularly. These two types are often in contrast with each other. What gives? A seven foot tall individual can become a guard. But, if everyone else on the team is shorter than he, it may benefit the team most for him to play center. His relative height drives his eventual actions. If seven feet is abnormally tall for his group of friends then he is more likely to find himself playing center quite often. The extra time gives him practice others do not receive, and he gains further skills in that position. His essence becomes realized. His actions reinforce his essence, and around they go. This is how your essence or nature reinforces what you already were becoming. And, since we are all prone to forming habits, we should confront our favored reactions to certain situations early and purposefully. If you are seven feet tall and walk onto a basketball court, be prepared to play center. We can learn to compensate through practice. Or, we can chose to avoid situations where we move into a position we are trying to avoid. If you are seven feet tall and desire to play guard, you should walk on courts where others are very tall. Prior to Little Engine Ventures (LEV) I described myself as an entrepreneur (I generally hate titles –I’m a complex individual who doesn’t want to be generalized.) I was independent, goal oriented and ambitious. “Entrepreneur” as a job title has the benefit of being the Motley Fool with a chance at making money. I was absolutely interested in making money from a very early age. I desired it not because I am greedy, but because money is a proxy for freedom. And, I demand freedom. As a self professed entrepreneur, I didn’t care if people couldn’t see I was actually risk-averse. It was easier for them to imagine me as a thrill-seeking goofball. The few that know me well would never describe me this way. And I don’t see myself this way. I am not much different now. I have a few more experiences and have read more. I also have more financial freedom and thus my title matters a bit less. But, I still have to communicate my spirit and temperament in an efficient manner to accomplish my goal (I still hate titles.) Instead, I now call myself an investor. Or, “an entrepreneur turned investor.” It’s less awkward than saying “I’m an INTJ, Mastermind pretending not to be a Choleric; what are you?” An entrepreneur and an investor are basically the same thing in my head. And, they are not untrue descriptions. I allocate capital as if it were my own, and I leave the minutia of details to teammates that are better equipped to be point guards than I. The primary benefit of knowing your spirit is to fit yourself into a position on the court that best serves the overall objective of the game. What does winning look like to you? What is the desired result? What behaviors are required? Who is most naturally inclined to those behaviors? Is it you? A secondary benefit of studying temperament is improving your placement of others into positions in which they can excel. We all lead in some way and most of us desire to improve our leadership. If you understand how a Sanguine or Melancholic might view –and thus act– in a situation then you can help them be the best versions of themselves. We should excel as a higher functioning group and society as a result. I have a lot to learn about other people. Fortunately, I have a lot of patient people around me that extend grace daily. They point out my actions and inquire of my spirit. Ultimately, I owe it to them to do the same. It’s not easy, but it’s my role to confront reality with the ideal. Can you determine your own temperament? I don’t know if you can, but I do know that it is possible. And those that can, do. And those that do, will do. The successful allocation of your time and resources does not require intelligence. Many intelligent people justify poor actions with complex mental gymnastics and live unhappy, unproductive, empty lives. Please avoid that court. Choose a court with friends that need you. This entry was posted in Guiding Principles. Bookmark the permalink.